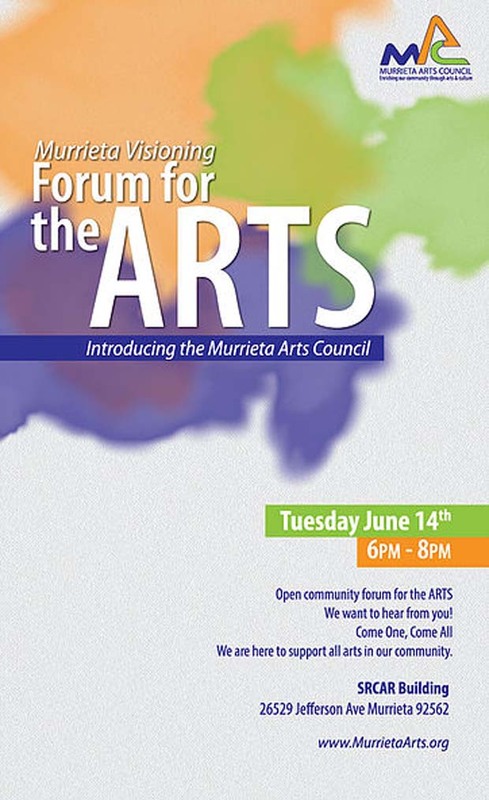 The new Murrieta Arts Council has scheduled a Forum for the Arts to allow people who are interested and/or involved in the arts the chance to meet and talk. The free event will take place June 14 from 6-8 p.m. at the Southwest Riverside County Association of Realtors office, 26529 Jefferson Ave. Guests will have the opportunity to network and learn more about the new arts council in their city. They will be asked to complete a form including questions such as "What is your wish list?" and "What skills or assistance can you provide?" "We're hoping to see mostly 18 and older -- writers, musicians, dancers, teachers and performers of all kinds, in addition to painters, sculptors and photographers," said Peter Thorwarth, MAC board member. "The Arts Council knows there is a wealth of talent in Murrieta. There are also many others who enjoy and appreciate the arts. It may be the largest gathering of Murrieta talent to date." For more information, visit murrietaarts.org.